Install Apple Intel Video Drivers on your PPC Powermac and get screen Rotation (on Supported Cards) & Better Support for Recent Nvidia Video Cards. Note: This article is irrelevant to Mac OS X 10.5 Leopard, since its PowerPC drivers are on par with the Intel ones. There seems to be some confusion concerning the method of how to update a PPC machine with the Apple Intel driver version, so here is a easy to follow guide….. I would advise you try this hack on a cloned firewire drive first & if you are happy with it, you can clone back to your main drive. The Mac Elite will not be liable if you mess up your system. Do not try this hack on your everyday system - It may not work! 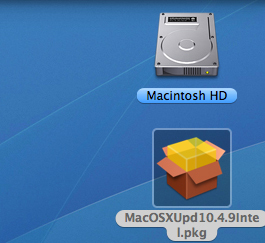 Unpack it till it looks like the small opened box then drag it to your desktop. You must drag it to your desktop! 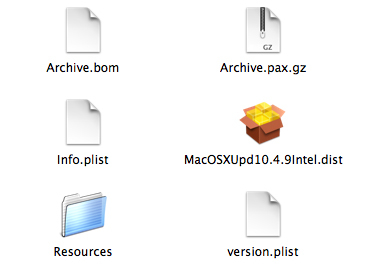 Right click on it & click "Show package contents" & you will see it contains another small opened box called MacOSXUpd10.4.9Intel.dist. Move this sub-package to the trash. You will not be needing it anymore. 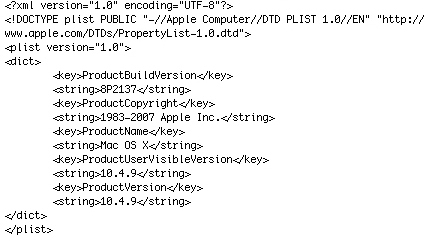 Open the package up in the same way as explained above, but this time extract from inside the package, the sub package MacOSXUpd10.4.9PPC.dist and drag it to your desktop. You are only going to keep this package so you can drag the remainder of the PPC update to the trash. 3. 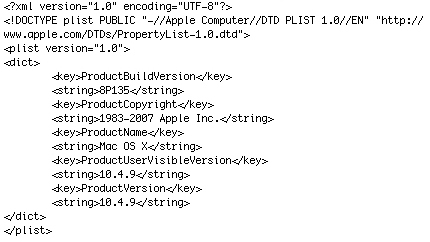 Rename the "MacOSXUpd10.4.9PPC.dist" package that you kept & call it "MacOSXUpd10.4.9Intel.dist", (leave out the quotation marks) & place it back into the intel package where you had previously deleted the intel sub-package. You can close up the package now it is ready for use. You need to edit the Systemversion.plist that can be found in System/Library/Core Services. If this is not done, software update will download future intel updates instead of PPC. Drag Systemversion.plist to your desktop & open with Text edit. It currently will show a system version of 8P2137. This needs to be changed to 8P135. Save the change then put your changed file back in Core Services. You must repair permissions in the Terminal (in your utilities folder). Download this small script to repair your permissions at root level automatically. (Very useful little time saver provided by Gotoh). Put it in your utilities folder and double click any time you are required to repair permissions of system files. Wait for this to finish then reboot. Credit for this hack goes to Nvflash at The Mac Elite.